If you have booked railway ticket online on IRCTC website and for some reasons you are not able to travel, than here is very helpful tutorial for you which will help you on How to Cancel IRCTC e-Ticket Online. Before you proceed with the process on How to Cancel IRCTC e-Ticket Online, let me make familiar with terms and conditions of cancellation of IRCTC e-Tickets. No refund shall be granted on the confirmed ticket after four hours before the scheduled departure of the train. No refund shall be granted on the RAC or Waitlisted ticket after thirty minutes before the scheduled departure of the train. 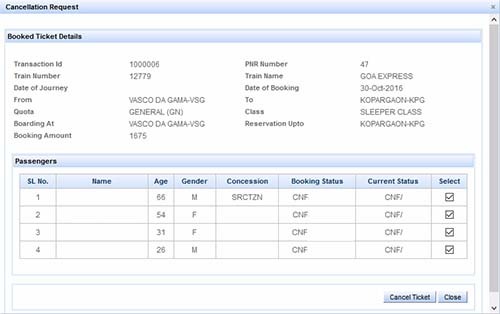 In case, on a party e-ticket or a family e-ticket issued for travel of more than one passenger, some passengers have confirmed reservation and others are on RAC or waiting list, full refund of fare, less clerk age, shall be admissible for confirmed passengers also subject to the condition that the ticket shall be cancelled online or online TDR shall be filed for all the passengers up to thirty minutes before the scheduled departure of the train. So below is the complete guide which will help you on How to Cancel IRCTC e-Ticket Online and get your money refunded to your bank or card, so let’s get started with the process on How to Cancel IRCTC e-Ticket Online. Just login into IRCTC Portal by entering your User ID, Password, Solving Captcha and hit on login button by clicking here. Once you are logged into your account, from dashboard screen just click on tab My Transaction and under that just click on Booked Ticket History. On next page all booked tickets history will be viewed, to cancel the ticket just select the booked ticket and from below option just click on cancel ticket button. On next prompt entire details of the passengers will be displayed, just select which all passengers tickets you want to cancel (if you want to cancel all passengers tickets than select all, and if you want to partially cancel ticket than select which all passengers tickets you want to cancel) and then click on Cancel Ticket button. A prompt will be displayed confirming whether you want to process the cancellation request so to proceed just click on OK button. A new page will be popped up showing your IRCTC e-Ticketing Service Electronic Cancellation Slip, which means your ticket has been cancelled successfully. The IRCTC e-Ticketing Service Electronic Cancellation Slip will also show total collected fare, cancellation fee and total amount to be refunded to your bank account or card. Your refund will get credited back into your bank account or card by 7 to 10 working days. 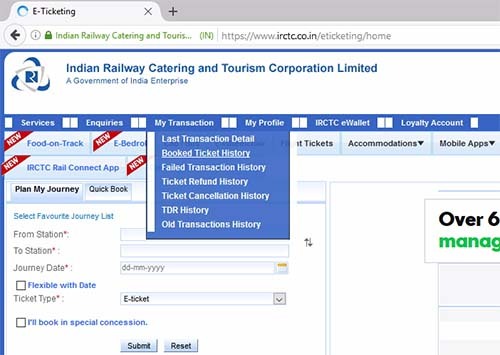 This is how you can easily cancel your booked Train e-Ticket on IRCTC Portal.